“I said this right away when we found out she had a secret server. 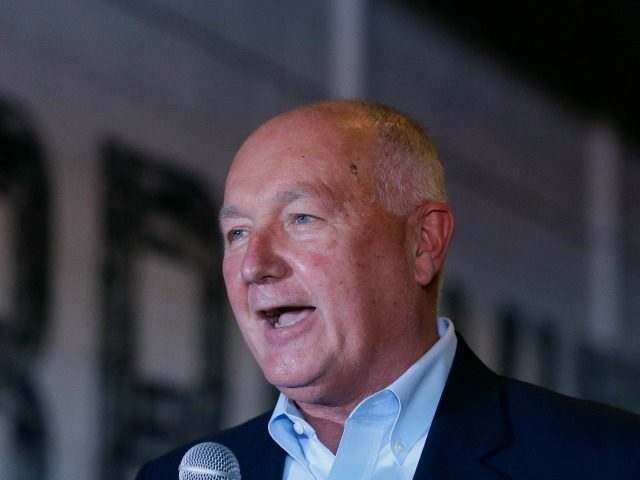 I said, ‘OK, that thing was hacked by the Russians, the Chinese, the Iranians, and maybe some other governments,'” Hoekstra said on “Breitbart News Saturday” on Sirius/XM Channel 125. Clinton could face espionage charges if FBI investigators find that she permitted national defense information to be “lost, stolen, abstracted, or destroyed” through “gross negligence,” which includes dishonesty. “They’re attacking our government institutions each and every day. They’re attacking the State Department. And they’re very, very good. Going into a server in your basement? You know how long it’s going to take these guys to get into that? Not very long. And what are they looking for? They’re looking for real-time information, in terms of what we’re doing, what we’re planning, and those kinds of things,” Hoekstra said, citing his experience as the top House intelligence authority from 2003 to 2007. I’ve got a pretty high degree of confidence, higher than the FBI’s 99 percent confidence, that these things were hacked. I’m 100 percent confident that they were hacked. And some of this stuff was happening and happening in real time. At the same time Hillary was sending the emails, with classified information to her daughter, that the Russians and the Chinese and the Iranians were probably picking it up at the same time. Wouldn’t we love to have in real time, the emails and the electronic communications of the Russian foreign minister, the Iranian foreign minister, and the Chinese? They’re going to use that to exploit their advantage in their global strategy. That is what was going on. Our enemies were getting information on our national security issues, our economic security issues, in real time to plan their strategy for how they will thwart American interest. So what did we lose? Did she identify some of our sources? Some of the people that were working for the United States getting information. If we did, then we’ve got to go back and get those people out of the field. People might have died because of the information that she left and put onto her server. …In their tenure, over 500,000 people have died in Syria. There’s been genocide in Iraq and Syria, thousands of people killed in Libya. That’s the thing that’s been the most dangerous, is where we can directly identify people having died as a result of their actions. …Hillary Clinton went to great lengths to hide the fact that she was using a private email server. She emailed with President Obama while Obama was using a pseudonym. She kept her own State Department IT Help Desk in the dark about her secret email activities, because her private email account got flagged when she tried to send emails to her own staff. “It bounced back. She called the email help desk at state (I guess assuming u had state email) and told them that. They had no idea it was YOU,” Abedin told her. Clinton even paid a firm in Jacksonville called “Perfect Privacy LLC” to plug in phony owner names for her email network on Internet databases. The server had an open webmail portal, making it easily vulnerable to run-of-the-mill hackers. James Comey noted evidence showing hacks by “hostile actors.” Capitol Hill sources speak in hushed tones about the “Russian Files,” which are said to include information about a Russian hack. Clinton was warned of a security “vulnerability” on her BlackBerry on her first official trip to China, and the State Department told her to stop using it. But Clinton decided to keep using it. She told a private audience in a paid speech that her BlackBerry was under attack constantly by the Chinese and Russians. Breitbart News reported that Clinton shared and posted the names of CIA-protected intelligence sources on her non-secure server, including the name of a defense attache and other agents working on issues related to Iran and the Taliban. Clinton’s email account included exact locations and travel plans for her Libyan ambassador Chris Stevens, who was killed in the Benghazi attack. CLINTON: But, at the State Department we were attacked every hour, more than once an hour by incoming efforts to penetrate everything we had. And that was true across the U.S. government. And we knew it was going on when I would go to China, or I would go to Russia, we would leave all of our electronic equipment on the plane, with the batteries out, because this is a new frontier. And they’re trying to find out not just about what we do in our government. They’re trying to find out about what a lot of companies do and they were going after the personal emails of people who worked in the State Department.